Spent many an evening alone alas! When would the Baron be feeble? thought he. When will I rule this township eh? When I am old and bent and Grey? The Lady met the Son oft there, after sundown. When then will we ever be free? And whispered, Hey! That's my Father's Window! Lady Bandit! thou hast come for me! Its my life, my love, it is the town for me. Your father is strong but I like your house. Enough of Jewellery plundered on horse! Telling the son to wait till next night. And wore a black catsuit! And knew not where to look. Canst thou cook Truffles, my sweet? She was a Bandit, a rogue, through and through. She did conquer the Sons heart. For what do you know? He had died of a stroke! The Bandit, the Cook, the poisoner sweet. His wife never did cook anymore! Lived on, in Peace, with its Bandits! 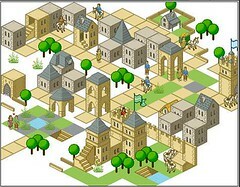 The town design was made using City Creator, a fun site. On sharing with Sash he wanted to know who it was on the roof of the biggest building. Enough for fertile minds, we started a story, which before I knew it I made into a rhyme, and thence, a Ballad. So I shared it. little did i believe till i heard it from your own lips!..